It is breakfast time. Outside, there are blue skies and the lake water is blue as well. Caragh Lake is a big and beautiful body of water and I’m staying in Carrig House on the shore. Carrig, by the way, serves one of the best breakfasts in Ireland, so all in all it is rather a perfect morning. And would still be a very good one even if, as sometimes happens, the sun doesn't shine! With breakfast behind us, we are well placed to take in the local sights of this part of south west Kerry, known as the Iveragh Peninsula. It is the largest peninsula in southwestern Ireland. The Macgillycuddy's Reeks, with Carrauntuohill the highest point, lies in the centre of the peninsula. And not too far away is Killorglin, Cahersiveen, Valentia Island, the Skelligs, the Skellig Ring, Ballinskelligs, Waterville and many other places worth a visit. Good morning. What would you like for breakfast? We were here for three nights. 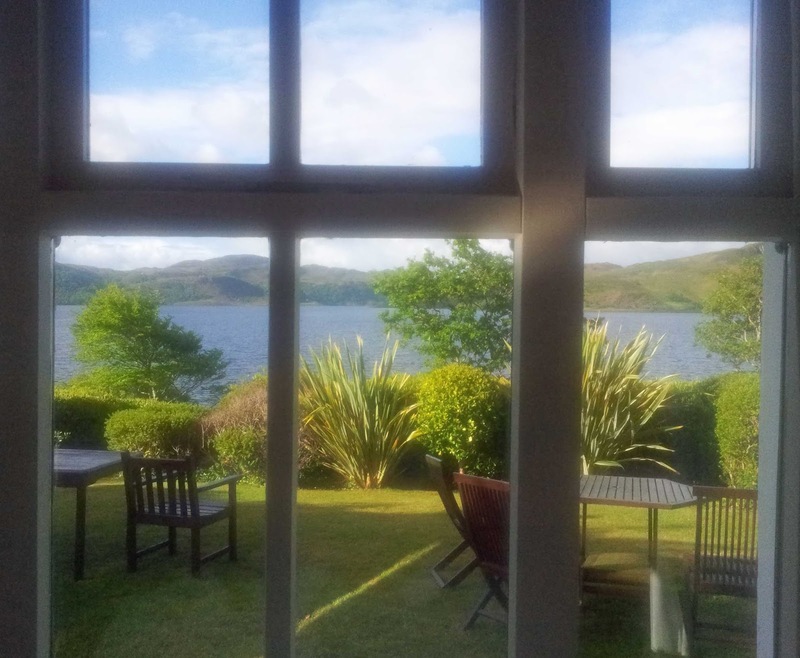 Carrig, with its 17 guest rooms, doesn't come cheap but a gift of a Blue Book Voucher eases the hit on the wallet as does everything else here: the comfort, the welcome, the gardens, the courtesy, the chat, the private pier onto the lake, and the food. Fish of course is a regular on the menu and we concentrated on it for one of our dinners. 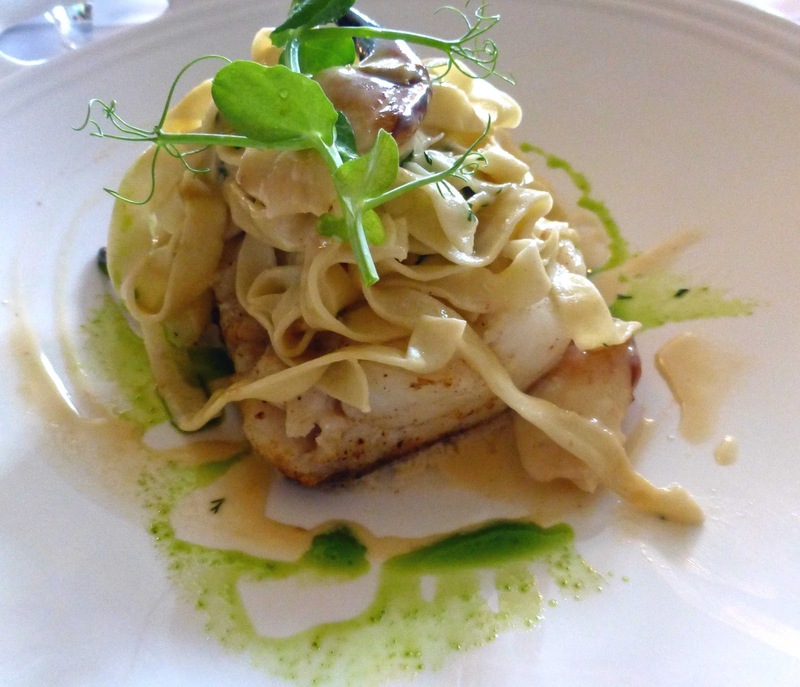 Roasted West Coast Cod Fillet topped with fresh Dingle Bay crab and prawns, fresh tagliatelle, morel mushroom velouté was my choice and it was delicious all the way. Our other mains was the Steamed Atlantic Stone-bass with asparagus three ways (seared, marinated, and crumb-coated), vinaigrette on a Cooleeny crème swish, balsamic pearls. 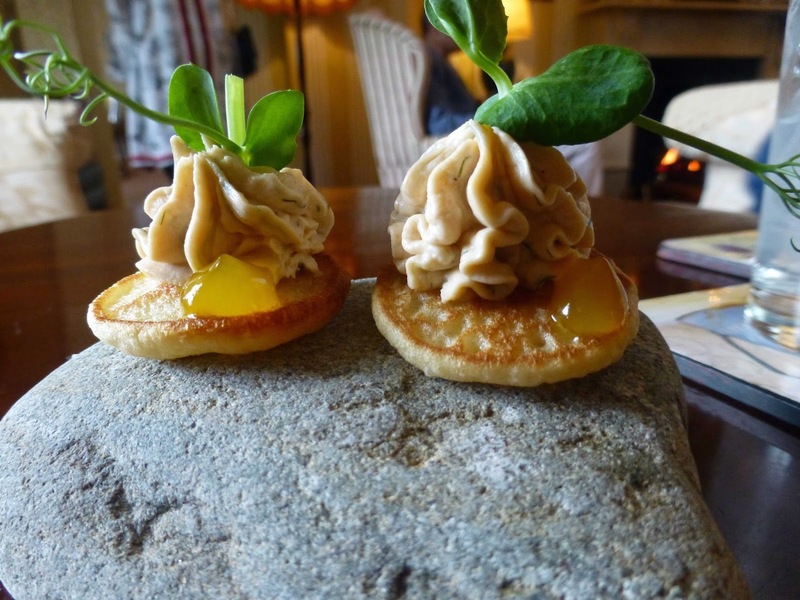 After a lovely amuse bouche by the fire in one of the drawing rooms, we had each started with Warm Spice Infused Quail, Beluga lentil Mung Bean jus and pickled onions. Not the easiest meat to pick off the small bones but it came with a big flavour, enhanced no end by the lentils and the onions. 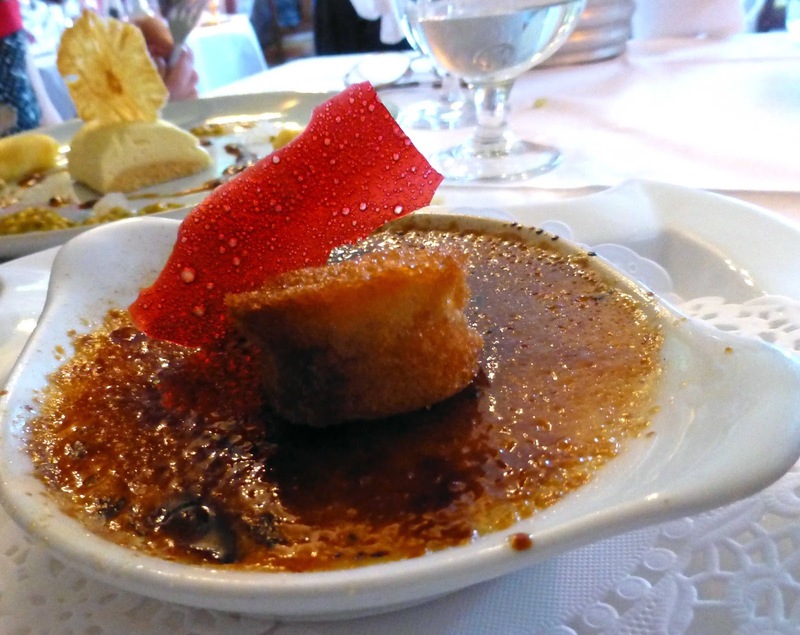 My dessert was another Carrig House gem, Rich Vanilla Crème Brûlée, cherry and hazelnut financier, and fruit tuile while CL indulged in the Passionfruit Marshmallow with roasted pineapple chiboust, pineapple parcels, and liquorice caramel. The rooms are superb here, spacious and ultra comfortable. Ours had a view of the gardens but you can also get some with lake views. Wi-Fi is pretty good but the network service for mobiles is not. 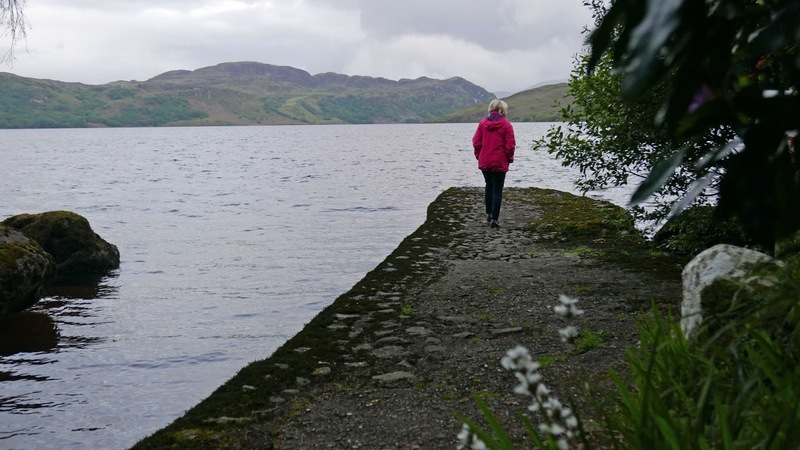 And don’t be put off if you see a brown tint in the water - the reservoir is in bogland - and the water is perfectly safe for washing yourself. And they do provide bottled water in the rooms. The bathroom, at least in our case, was spacious and well equipped with toiletries and towels (best bring your own face cloths, a general rule) and you do have a full sized bath as well as the shower. The decor is beautiful all through the house. Newspapers are in good supply too if you want to sit by the fire and take it easy until that shower passes. Then again, if the sun is out, you’ll find it hard to resist taking a stroll around the colourful gardens, maybe an amble down to the lake. Then, when you (don’t mind those fishermen who headed off early) are good and ready, you can head out for the day. The coast? The mountains? The choice is yours. And remember you'll have a stunning dinner to come back to! Carrig House was built originally about 1850 as a hunting lodge. Frank and Mary Slattery, the current owners, purchased Carrig in 1996. 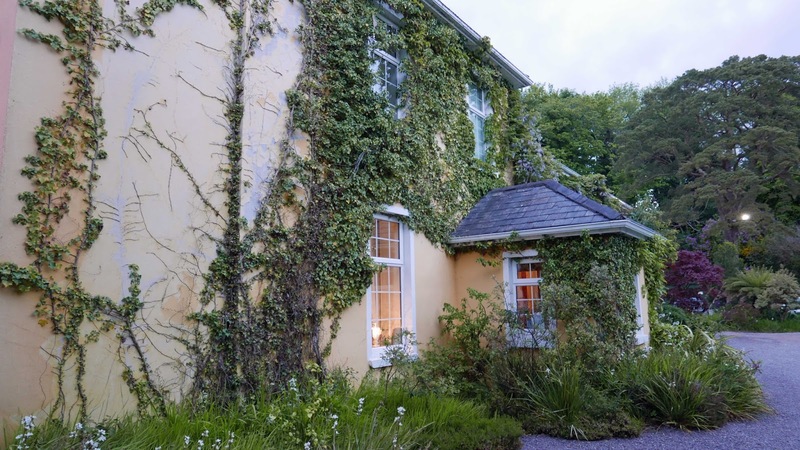 They are the first Irish owners since it was originally built and have renovated and meticulously restored the Victorian residence to its former glory. The atmosphere, they say, is friendly, warm and one of total relaxation. It certainly is!